Recently, the oh-so-talented Julia from Pawley's Island Posh did a guest post on Sadie + Stella on a favorite room in her home. 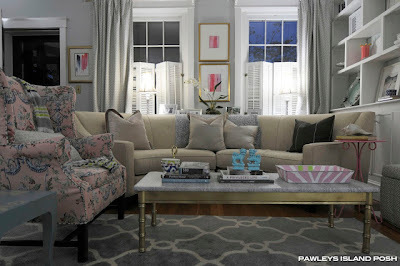 Julia's decor style is right up my alley ... classic with a punch of whimsy, clean with a touch of comfort. And color -- the girl is not afraid of a little color. My eye was drawn immediately to her great artwork which was featured in simple frames with large mats. I left a comment on the guest post inquiring about the source, and sweet Julia hunted down my email address and got back to me. The frames and mats, she explained, were found at Tuesday Morning -- she popped out the artwork that came in them and added her own watercolors. I love Tuesday Morning, and I headed that way with her token piece of advice: "Just be sure to look past the fugly art thats probably lurking in pretty frames! xoxox"
This is easily one of my favorite stores to peruse. There is one about 10 minutes away from my office that I love to visit every two weeks or so on my lunchbreak. I need more of these like I need a hole in my head ... honestly. My collection is bordering on Hoarder-worthy. But I can't get enough of them! I have a pretty mother of pearl hand towel holder in our guest bath. That way, when people come over they have a nice way of drying their hands, and they don't have to worry with that icky "am I drying my hands on someone's bath towel?" feeling. You can get the very pricey Caspari hand towels, but Tuesday Morning always has a great assortment for around $2.99. These candlesticks remind me of the coveted Juliska pattern. I also have a similar bud vase from Anthropoligie. At $14.99, though, these are a steal. I purchased the 5x7 rugs for our home office and ﻿den from Tuesday Morning at a heck of a steal. This cute rose rug is just too cute and would look great in a bathroom or little girl's room. Do you have a Tuesday Morning close to home? Um yes but not with this much amazing stuff?! I actually used to work at a Tuesday Morning one summer during college. It was a challenge to make money there, because I was so tempted to buy so much! I don't have one near me now, but whenever I go home you better believe that is one of the first places I go! HA I read this as Shopping *ON* Tuesday Morning, I was like "YES! playing hooky to shop" but then I re-read... anyhoo. :) Never heard of this store because we only have crapola Home Goods and the like up here in the north. LOVE all your finds! Oh how I love Tuesday Morning! Your post has made me want to head that way right now. There are always fabulous deals to be found. You found some great stuff! I've been shopping at Tuesday Morning for years. Love it. I bought several rugs there too. We have a drink bucket we registered and received for our wedding but I so wish it was on a stand now. I also love "Tuesday's." I've had to sneak a few things in over the years. Oy. But the price for what you get can be incredible. I agree with some of the other commenters - your Tuesday's looks like it has way better stuff than mine! I also have a Homegoods obsession. Oy. Love Tuesday Morning! It is a dangerous store! I have spent hours in their napkin section, trying to find matching pairs! It can be addicting! Boo! I've never heard of it, which probably means that Minnesota doesn't have any! Love those napkins. I always stock up at Ikea when they have cute ones. Love those napkins! We don't live close to a Tuesday morning anymore, but I will have to check the one by my parents the next time we are there. Jamie may- there is a store in Bloomington by south town and I think in burnsville, too. April- love your finds! Where is this TM located in Charlotte? Such a fun collection of goodies! I love TJ Maxx but never go to Tuesday Morning very much. I guess I'll have to make sure I check it out. i am BEYOND jealous April!! Our Tuesday Morning is NOTHING like yours...score for you, but i am hoping ours gets some of those goodies soon, too! Our Tuesday Morning is pretty rough around the edges. The Home Goods is the only one that always seems to have stuff in my taste! We have a Tuesday Morning, but I don't frequent it enough! I'm doing a similar TJ Maxx post soon! We have one here but I have never been! I honestly thought it was like a Big Lots or something. I'll have to check it out! you are so sweet! Did you find any good frames there yet? They're lurking at all the home stores!